Duke Cannon doesn't spend all day typing emails on a laptop. He sure as hell hasn't gotten a manicure. His hands build tangible things like V8 engines and two story decks. And hard work makes hands dirty. 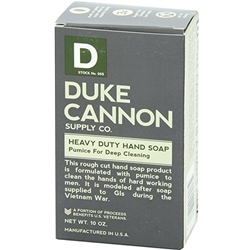 That's why Duke Cannon created a Heavy Duty Hand Soap, a rough cut brick formulated with pumice to clean the hands of hard working men. It is modeled after heavy duty soap supplied to GIs during the Vietnam War. Like all Duke Cannon Bricks of Soap, this one weighs in at a hefty 10 oz., almost 2x the size of other pumice soaps.